Where belonging is more important than belief, and ALL are welcome to the table. We are a theologically diverse community in association with the United Church of Christ and the Unitarian Universalist Association. We welcome those who want to follow Christ, who have doubts, and do not believe. We welcome people of all ages, races, nationalities, abilities, sexualities and gender identities. We know that the church at times has rejected difference and denied God’s promises for itself and for others which is why we say without reservation that you are welcome here, as God welcomes you, as a beloved child. We welcome people of all ages and abilities, and are now fully wheelchair accessible. Click below to learn more about our history and what we have to offer! 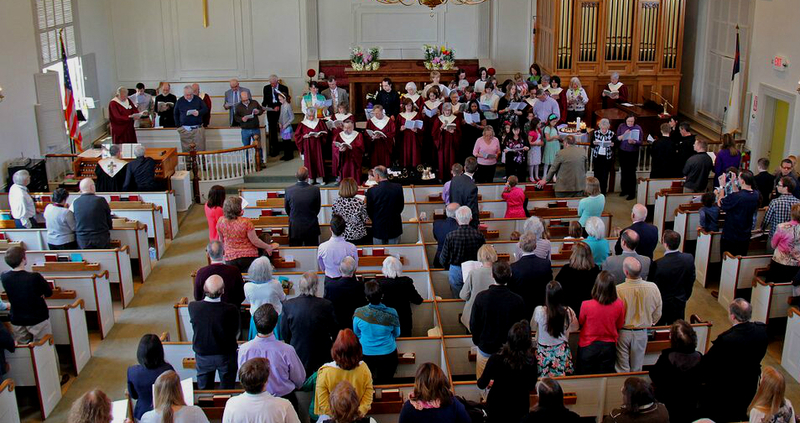 We, the First Church in Sterling, value and welcome a diverse congregation. We are an Open and Affirming (ONA) church, believing that each of us is created in God’s image. We celebrate everyone, including people of all ages, races, cultures, sexual orientations, gender identities and expressions, family configurations, economic circumstances, physical, cognitive or emotional abilities, education, or spiritual and religious traditions. We recognize that the LGBTQ (Lesbian, Gay, Bisexual, Transgender, and Queer) community has been the target of discrimination and judgment and we consciously choose to renounce any discrimination and judgment, by declaring ourselves an open and affirming church, embracing justice and welcoming all people, including people of diverse sexual and gender orientation into the full communion of our church and our friendship. As we gather in the spirit of Jesus, we commit ourselves to the ongoing work of being an Open and Affirming congregation, one that lives out the belief that God is still speaking. With God’s grace, we endeavor to create heaven on earth.